Trance troupe to soundtrack Virgin Galactic's first flight? 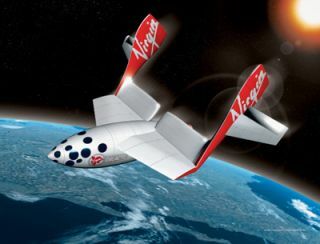 A UK band has asked Richard Branson if they can supply some trance music for Virgin Galactic's first passenger trip. Trance group Above & Beyond have pleaded Branson to let them DJ on the first suborbital trip into space. Test flights are rumoured to be starting next year, though there has been no official date set for the first flight with paying customers (and, perhaps, British Trance troupes…). Above & Beyond played at the launch event for SpaceShipTwo in the Mojave desert this week, which is one of Virgin Galactic's fleet. Above & Beyond's Jono Grant told the NME: "We're big fans of all things space-related and so in terms of dream gigs, this is up there alongside our performance in Rio to one million people. "We're now hoping to persuade Richard [Branson] to let us DJ on the first passenger flight into space." Above and Beyond's track Buzz samples Buzz Aldrin's legendary moon-landing dialogue. It is still rumoured that Liam Gallagher shelled out the £200,000 fee to book a flight for brother Noel as a birthday present.